Looking for baby shower cupcakes? | Land of Cakes New York makes unique baby shower cupcakes. Baby shower cupcakes are the perfect treat your next shower celebration. Our cupcakes are tailor made to your specifications and we will gladly accommodate any number of guests. 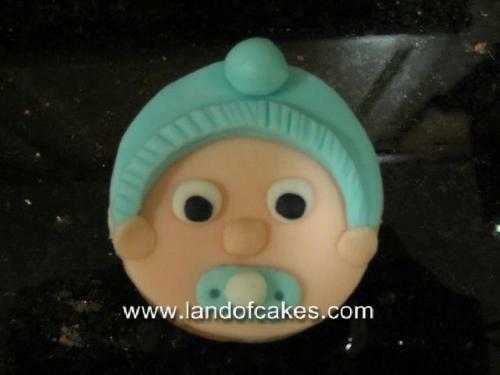 The baby shower cupcake pictured here represents the face of a baby girl wearing a hat with a pacifier in her mouth. The flavors of this particular cupcake is vanilla caked filled with a special made buttercream filling. We also have a variety of other fillings which are listed on our info page. The great thing about baby shower cupcakes is that they are extremely easy to serve and they are sure to please any crowd. Cupcakes are also an easy way to incorporate a theme into your party. We can create one or multiple themes using cupcakes. Some customers have even used them as favors for their baby shower guests. For this use we can even make each cupcake unique, which is sure to impress your guests. While baby shower cupcakes are a great idea for the party, keep in mind that cupcakes are also perfect for other occasions such as kids birthday parties, picnics, and even weddings too. Order yours today! Land of Cakes New York makes delicious baby shower cupcakes.